← Why Are Energy Prices Still Rising in New England? 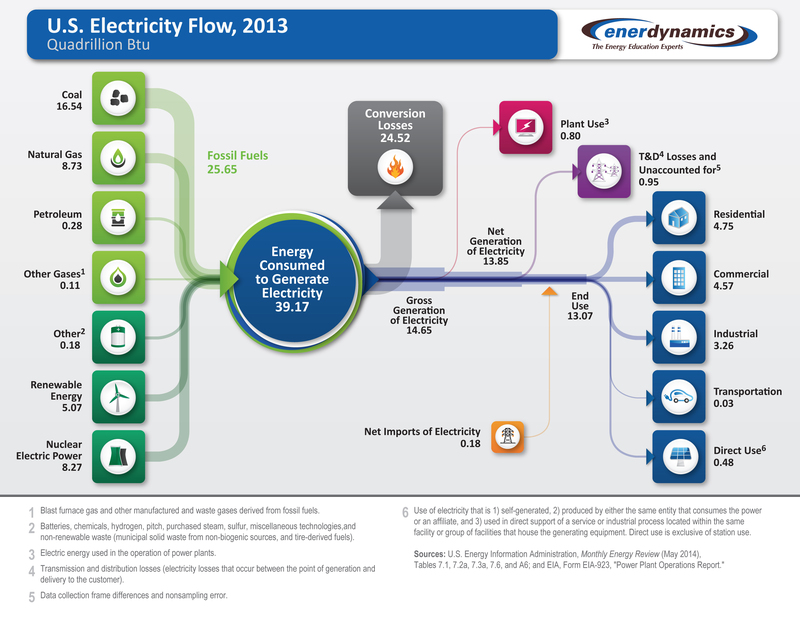 This graphic is based on data from the Energy Information Administration and shows the input fuels, conversion losses, transmission and distribution losses, and end-use consumption through the electricity delivery chain. It is an easy way to quickly view how we in the U.S. create electricity and how we use it. 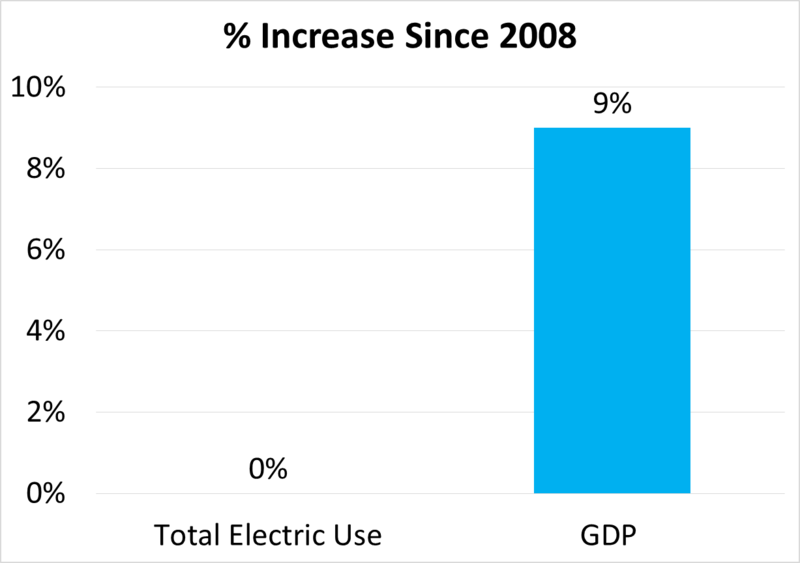 Despite a 9% increase in U.S. gross domestic product (GDP) since 2008, electricity use has not increased. This is primarily due to improvements in energy efficiency. Many people intuitively believe flat demand is due to a decrease in industrial activity and a shift in our economy to services. But in fact, industrial use has declined by 3% over the five years while the U.S. Industrial Production Index increased by 2.5%. 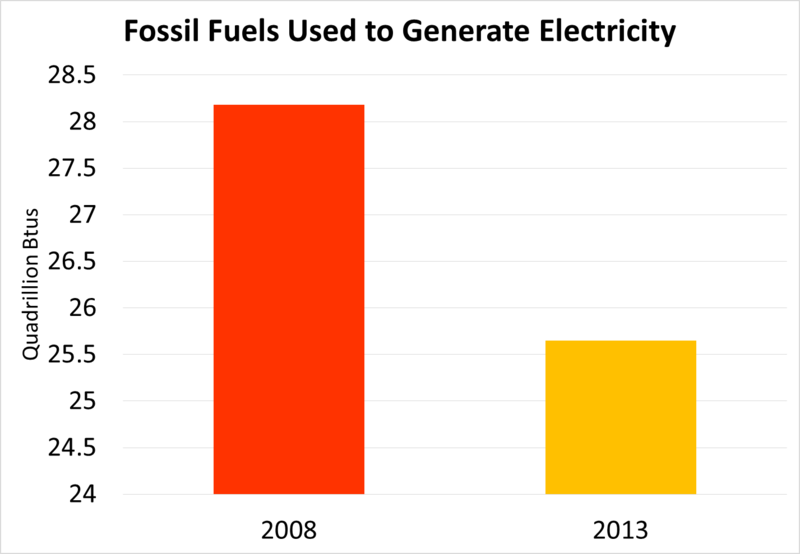 Over the five-year period, the fuel used to generate electricity has changed dramatically. 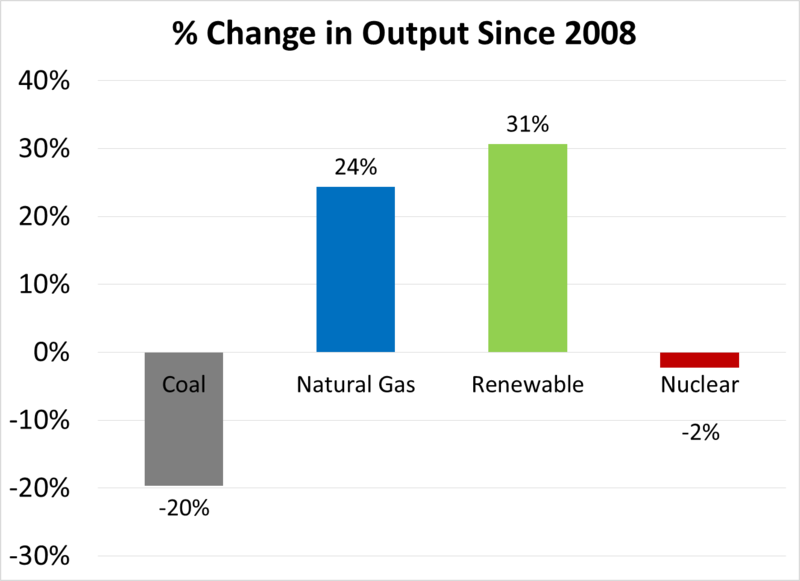 Coal use declined by 20% while natural gas and renewable use increased by 24% and 31%, respectively. This trend is likely to continue as numerous coal units have recently been or are soon to be retired and as new environmental regulations make it less economical to utilize coal-fired generation. The amount of fossil fuel energy used to generate electricity has declined by 9% while total electric output has been flat. This likely is the beginning of a long-term transition away from fossil fuels. The trend will be furthered over the next few years by increasing development of renewable projects and the opening of multiple new nuclear units in the U.S. Certainly there is still an open question of how far we can go in generating electricity from non-fossil fuels, but it is clear that a movement in that direction in underway. As these three trends indicate, we are in the midst of a dramatic transformation in our nation’s electricity consumption and generation. This entry was posted in Electricity, Renewables and tagged Coal-fired Generation, Electric Demand, electric generation, Electricity Consumption, Fossil Fuels, Renewable Energy. Bookmark the permalink.